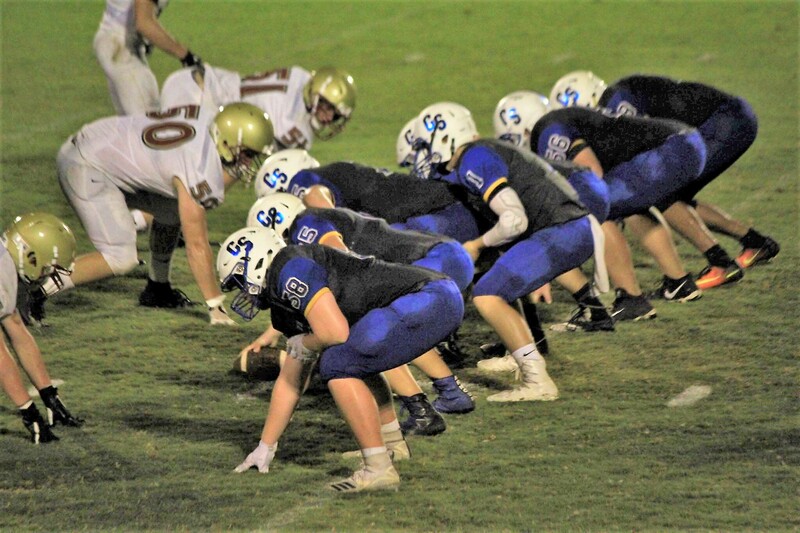 BREMEN – The Cold Springs Eagles (Class 2A, Region 5) hosted the Sumiton Christian Eagles (Class 2A Region 5) Friday night in the Eagles’ first home regional matchup. Cold Springs dominated the game, downing Sumiton Christian 33-14, bringing the Eagles’ record to 2-0 in the region and 4-0 for the season. Cold Springs took control of the game very quickly with a break- away run of 62 yards for a touchdown by senior running back Mason Harris, putting Cold Springs up 7 – 0. Sumiton Christian took over possession, but quickly turned it over on downs and Cold Springs took control at the 41-yard line. Cold Springs sophomore quarterback Brodi Williams threw a pass downfield for 26 yards putting Cold Springs at the 15, followed by a defensive penalty on Sumiton Christian. Cold Springs powered through and quickly scored on a 10-yard run by sophomore Ayden Alexander, putting the Eagles up 13-0 to end the first quarter. Sumiton Christian took possession of the ball at the start of the second quarter but continued to struggle, giving up another punt. Cold Springs drove down the field for yet another touchdown by Harris, taking the score to 20-0. Sumiton Christian took possession and started gaining ground en route to scoring its first points, cutting the lead to 20-7. Cold Springs out-gained Sumiton Christian in the first half by a gap of 263 to 132. Sumiton Christian received the ball at the start of the second half, but Cold Springs quickly got the ball back thanks to an interception by Alexander. Both teams battled back up and down the field, but Cold Springs scored again with a 29-yard run sophomore Houston McCarn, putting the Eagles up 26-7. Sumiton Christian fumbled on its next possession at the 24-yard line and the ball was recovered by Cold Springs’ Caleb McClendon. Cold Springs stared the final quarter strong, leading off with an 11-yard run by Alexander for a touchdown, the Blue and Gold up 33-7 over the Maroon and Gold. However, Sumiton Christian wasn’t throwing in the towel just yet, completing a beautiful 78-yard pass to pull the score to 33-14 with 1:22 left in the game. Cold Springs stalled the ball to close out its 33-14 victory. The leading rusher for Cold Springs was McCarn with 17 carries for 115 yards. Williams completed 9 of 15 passes for 99 yards passing. Francisco Ayala had six receptions for 72 yards. Alexander and Harris led in touchdowns with two apiece and McCarn added one to the total. Ayala led in tackles with six completed solo tackles. Alexander had two interceptions. Cold Springs outgained Sumiton Christian in total yardage 361 to 271. Next up, Cold Springs will hit the road to face its toughest competition this season, the Aliceville Yellow Jackets (Class 2A, Region 5) in another region matchup.